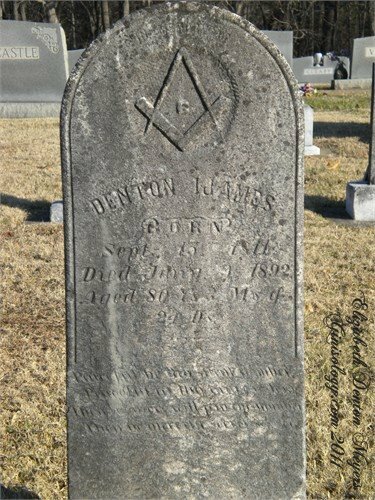 On this day, 200 years ago, my paternal 3rd great-grand uncle, Denton Ijames was born in Rowan, North Carolina. Denton was the son of Beale Ijams (1767 - 1855) and Elizabeth Ijams nee Little (1770-1848), my paternal fourth great-grandparents. Happy Birthday, uncle Denton . . . and on this same day, birthday wishes to your 3rd great-granddaughter, my 5th cousin, Elizabeth Denton M. . . . and birthday wishes to my 2nd great-grandfather, Richard Denton Ijames (1829-1902) . . . Happy Birthday to you all! Thank you, Elizabeth, for gifting me a photo of Denton's headstone ~ posted with Elizabeth's permission. I see he was a Mason -- so is my husband. That's great, Kathy. I haven't done too much research on Denton but it's great knowing what our ancestors occupations are!